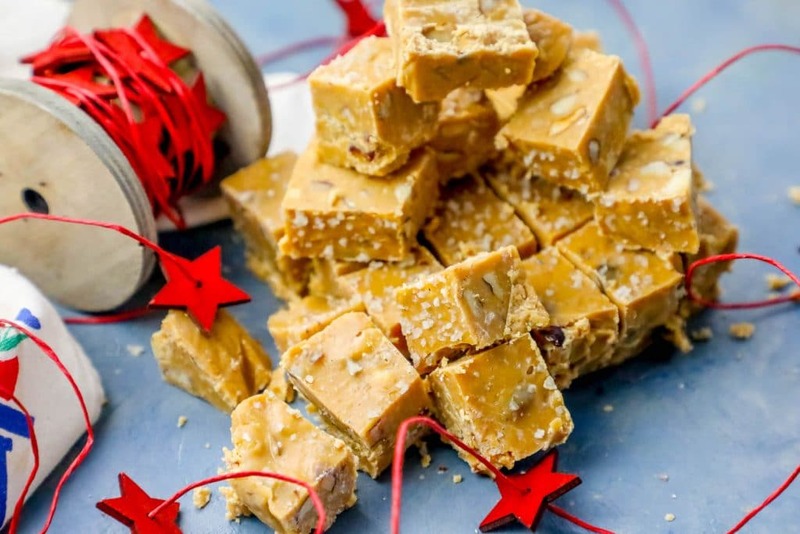 Deliciously easy Walnut Butterscotch Slow Cooker Fudge is the perfect festive Christmas treat – great for gifts or a cookie exchange! Christmas goes with fudge like peanut butter and jelly – it’s one of my favorite things to make and give during the holiday season. 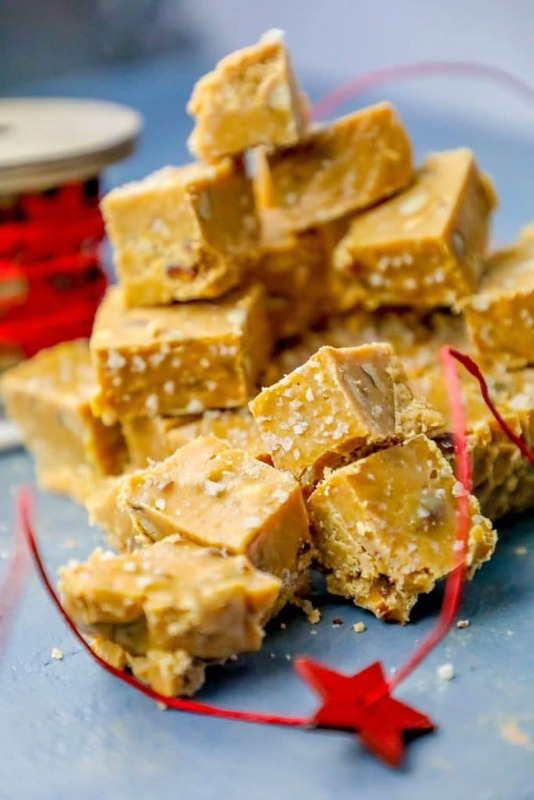 Fudge can be fussy – but it doesn’t have to be. Just keep an eye on it toward the end of cooking time, pour out, cool and enjoy! 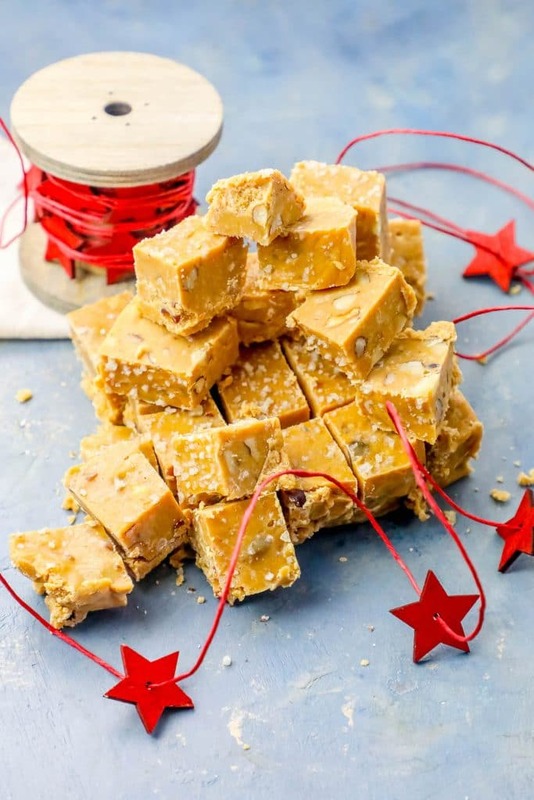 This fudge has practically no active cooking time, making it a great recipe to make while you’re busy baking Christmas cookies or cakes for a gift exchange, since you can whip up some while your other treats are cooking, without taking up precious stovetop or oven space! Walnut Butterscotch Slow Cooker Fudge is great as a teacher gift, hostess gift, or coworker gift – just pop them into a pretty jar and add a beautiful gift tag, and you’re done! 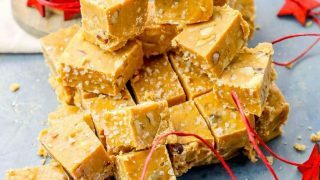 If making ahead of time, keep fudge in one large sheet in the freezer, in a tight bag with no air bubbles in the freezer, for up to 3 months. I actually like to keep it inside two bags – one that has all the extra air pushed out, and one over that bag to help prevent freezer burn. 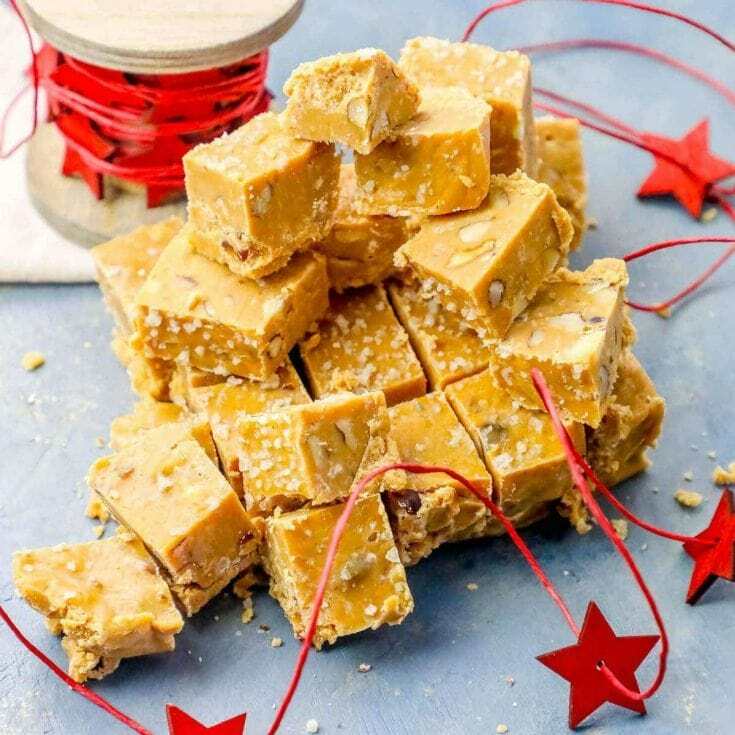 Do not slice fudge into squares until you’re going to give it away or eat it – this helps prevent it from drying out. Store uneaten fudge in an airtight container in a cool, dry place for up to 1 week; or 2 weeks refrigerated. 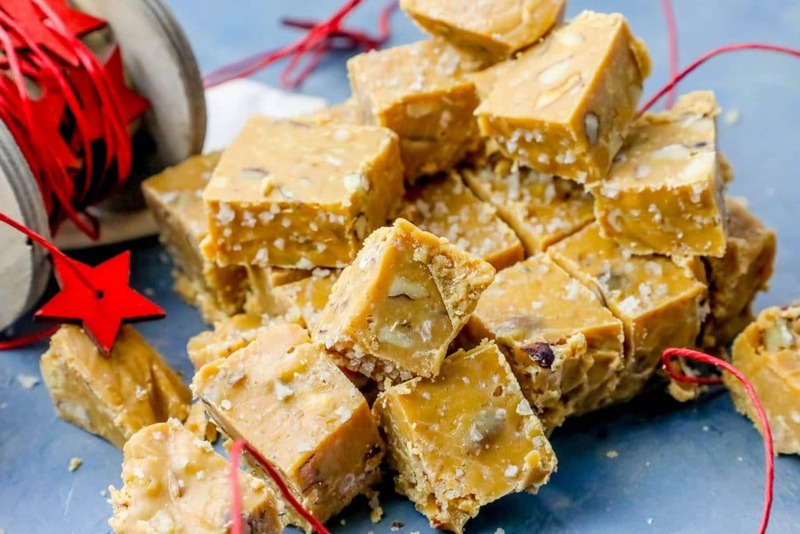 This super easy and incredibly delicious Walnut Butterscotch Slow Cooker Fudge is a truly simple recipe – just add the ingredients to a slow cooker, cook, stir, and cool for simple and stunning holiday perfect fudge! Don’t be alarmed if your fudge looks a bit darker around the edges – this is the caramelization of the sugar. It will mix in well with your fudge and bring a rich, buttery flavor to your fudge that is irresistible! Watch your crockpot carefully – your fudge will lightly brown, but don’t let it burn. Press down hard, and break it apart! 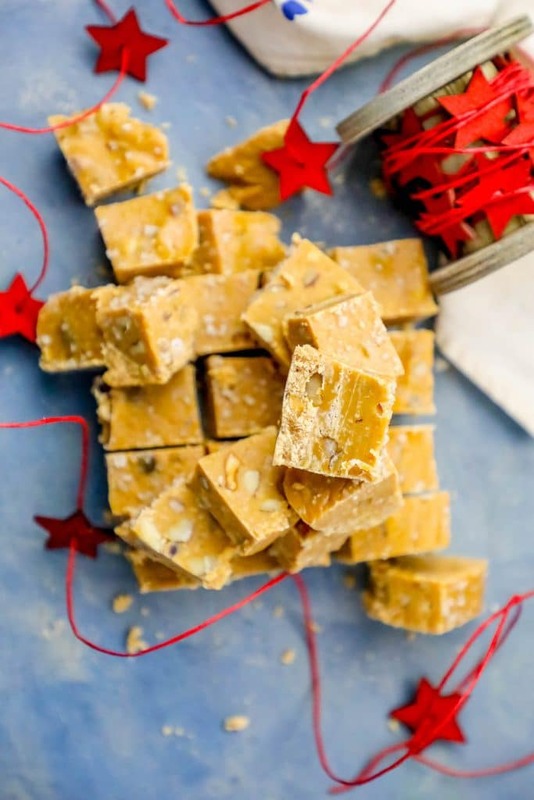 Deliciously easy Walnut Butterscotch Slow Cooker Fudge is the perfect festive Christmas treat - great for gifts or a cookie exchange! In a slow cooker, add white chocolate chips, butterscotch chips, and walnuts. After 4 hours, remove lid, stir well to mix, and pour into lined glass dish or silicone baking pan. Top fudge with celtic sea salt and press it lightly to stick to top of fudge. Cool in refrigerator for 2 hours or freezer for 1 hour. Remove from pan and slice to serve. Oh man, these look amaaaaazing!!! I’m a sucker for fudge!